MF3 is Back with New Appearance and New Feel ! Quality & Style, MF3 has it all. Organized by the Kuala Lumpur & Selangor Furniture Industry Association (KLSFIA), Malaysian Furniture & Furnishings Fair (MF3) is now back with a brand new prospect and experience for your participation! This Malaysia's most iconic furniture and furnishings event is all set to go on 10-12 August & 14-16 December 2018 at Kuala Lumpur Convention Centre. 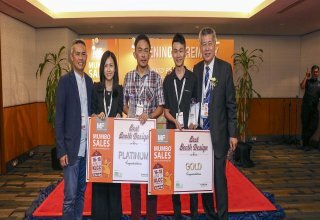 Rated as the best of its kind among home furniture fairs in Malaysia, MF3 shall provide all of our participants a '3Q' premier platform - Quality Products by Quality Exhibitors for Quality Visitors. Do not miss out the biggest revamp of MF3 coming to you soon! We are glad to announce that the 10th Furniture and Furnishings Fair (MF3) 2017 has successfully ended on 16 – 18 Jun 2017. “MUMBO SALESTM ’’was one of the highlight activities letting our visitors to grab the great deals in town of worth for their bucks. 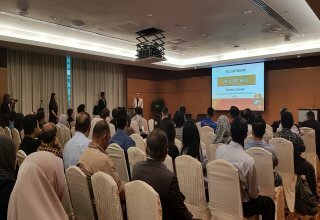 “Purchaser Lucky Draw”and “Spend & Redeem”activities given more rewards to visitors who spent a minimum amount were entitled to redeem unique and special gifts as well as stood a chance to win the attractive prizes. Total prizes given out during the exhibition worth more than RM175, 000. “Purchaser Lucky Draw” was held by MF3 Organizing Chairman, Mr Alfred Yow. Below listed are the lucky winners of MF3 and they were notified by the organizer for the cash prize collection. The “Best Booth Design Award”which specially organized to MF3 exhibitors to encourage creativity and design in the construction of the booth to give an attractive presentation and to furnish an added edge in attracting visitors. There were 2 prizes in this competition and over 100 booths were judged by Prof Dr. Khairul Aidil Azlin Abd Rahman, the Professor of Universiti Putra Malaysia and Ms Chua Huwi Huwi, the Deputy Head of First City University College. Big congratulations to the winners below. 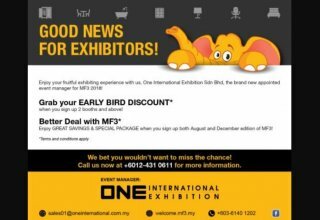 MF3 next exhibition will held on 2018, 10-12 Aug at KL Convention Centre. MF3 will be continuing to give our visitors a greater shopping experience in future MF3. For more information, please visit www.mf3.my, call 03-61401202 or email secretariat@klsfia.org.my. A beautiful and elegant type which offers a unique and classy look to any bathroom. While it offers both functionality and style, it is also an affordable method to transform your ordinary looking bathroom into a modern looking one. Waterfall faucets are made for three-hole installation and most of them are suitable for wall mounting. Before buying waterfall faucet for your sink, check out whether your sink comes with pre-drilled holes. Wall mounted faucets are mounted on the wall above the sink and extend over the center of the sink. They are best for sinks which do not have any hole drilling. This is a simple design best suitable for smaller sinks or vessels whose countertops are drilled for a single hole faucet. 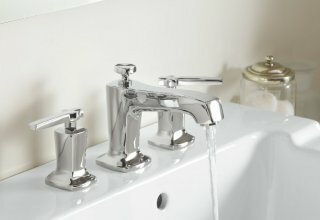 For those with a bigger sink, wide spread faucet can be an option to choose from. It has two handles located at the sides of the sink, each one for cold and hot water and a water spout. The three pieces are distanced further apart, requiring more space and are therefore, more suitable for bigger sinks. The hot and cold water comes from two different places and the unit requires a three-hole installation. Smaller than the wide spread faucet, this is an option suitable for those who requires both hot and cold water but with smaller sinks. It has a separate handle for hot and cold water on both the sides of a spout. They require three-hole installation basin as the spout and valves combine on one pool unit. First of all, you need to understand the meaning of “Tile”. It is referred commonly to ceramic, porcelain and glass when it comes to bathrooms. The materials come in different shapes and colors and can be laid in rows over a surface. Below is a simple, yet important list of guide that you may need to consider especially when it comes to the tiles used for your bathroom. At the end of the day, the material, cut, and size of the tiles for your bathroom depends on the functionality and practicality usage. The first step in selecting porcelain and ceramic tile is to match the tile to the use. Floor and counter tile must be resistant to spills and stains and most importantly, floor tile should never be slippery. PEI (Porcelain Enamel Institute) is a scale used on porcelain and ceramic tile to indicate the areas of use each manufacturer recommends and has designed their tile to fit based on foot traffic. Class 0 meant for areas with no foot traffic and it gradually increases all the way to Class 5 for heavy traffic. 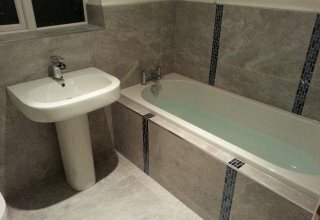 For porcelain and ceramic tile for your bathroom, best is to go with Class 2 to 3 meant for light to moderate traffic. Porcelain and ceramic tile can be either glazed or unglazed. Unglazed tile is solid, with consistent color throughout the tile and will retain color even as a surface wears. It is also available in various finishes, from rough to polished. Glazed tile has a protective coating on top of the dense tile body, which can be produced in a variety of colors or decorative patterns. The glaze can be a shiny or matte finish. Tiles for bathroom or other floors subject to moisture must be non-absorbent so water and other fluids do not penetrate and stain it. Most importantly, make sure that the tiles chosen should be always be certified slip-resistant to avoid slip-and-fall accidents. Pick the Right Color and Size. Color and design are obviously important, because porcelain and ceramic tile will last a while and making changes will require replacing tile, which is a lot of work. Both glazed and unglazed tile are available in a variety of colors and glazed tile frequently has decorative designs.Size is also a factor; floor tiles typically are larger, counter tiles smaller and wall tiles can be any size. Porcelain and ceramic tilealso come in various shapes that can be arranged in patterns. Since you spend one third of your life in bed, why not make it the best it can be? When choosing the right bed and frame, you will experience a rejuvenating rest that makes your days as blissful as your nights. Below is a guide for you to find some of the right bed, mattress, and bedding for your room. A divan is a base, on to which a mattress is added together with a headboard. They sometimes come as a bed package altogether. There are two types of divan base available. Pocket sprung divans have springs in the base, offering a softer top and extra comfort. Platform top divans come at a cheaper price and it gives a harder top and firmer feel, though the overall firmness of the bed will very much depend on the mattress chosen. Bedsteads are slatted frames usually made of metal or wood and comprised of a base, legs and headboard. 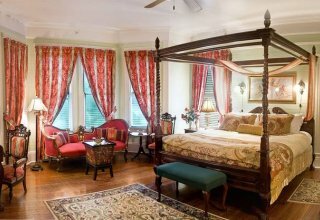 A more decorative option, it comes in different colors, finishes and styles to choose from such as a traditional pine bedstead or a luxurious four-poster bedstead. Storage beds offer lots of tidy storage options underneath the bed and it is a great choice for those short on bedroom space. They come with either storage drawers or an ottoman-style bed that fully lifts up, allowing you to store your belongings inside. A flexible and compact option that works well in a guest bedroom or when a bed is not used on a daily basis. To save space, just fold the bed in and it works well as a sofa to sit on and chill. One bed above the other. An excellent option for siblings sharing a room and it comes with loads of fun for kids too. Trying to pick paint color for your house can be a daunting task, not to mention stressful and intimidating at the same time. However, there are pointers you can follow to make this task a little easier and while at it, have some fun even. Start off by looking around your home and take an inventory of the permanent features surrounding you. Do you have dark-stained wood or marble floors or exposed beams? The hue and tone of all of these elements should be strongly considered before you move forward with your design unless you are planning to make changes to the permanent features in the near future. Your design process should always come first before choosing the paint color. Select your fabrics and furniture first, and then consider how they all come together. You may end up limiting your choices of furniture and fixtures if paint color is what you have decided on first. 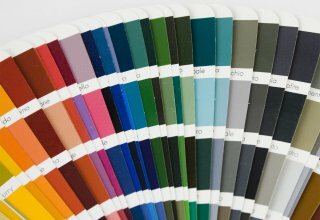 To find colors that complement your chosen fabrics, finishes, and furniture, use a color wheel. Hues opposite each other on the color wheel are complementary. 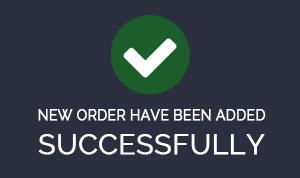 So, blue complements orange, and red-orange complements blue-green. This gives you a better guide on how to mix and match the colors in your home. Following trends may put you in a tough situation as the name suggest, a trend is a current thing people are crazy about but will eventually die off. Though your walls can be repainted, it’s not something you’ll want to do once a year. It is therefore, safer to go with something timeless and/or subtle. One of the biggest mistakes people make when painting their homes is not considering adjacent rooms and how the room works as a whole. The colors in your home—especially on the same floor—should have a cohesive palette and should complement each other. Always look at the color of your home as an overall to avoid such mistakes. Before you begin thinking of colors, you should ask yourself how you plan to use the space, as well as the person occupying the space. These are both important factors in color choice. For a workspace that needs to feel energizing, you may want to select a warm color, which has a stimulating effect. While for bedrooms, you may want to consider cool and calm colors to allow you to rest better at night. Dark moody colors can also be considered for bedrooms to create a nest-like effect. Lighting is one of the most essential factors to consider when selecting a paint color. Natural daylight shows the truest color, so if you have big, bright windows, your paint should turn out true to the swatch. But be mindful of what time of day you tend to use each room. Incandescent bulbs tend to bring out warm tones and yellows, and fluorescent lighting can cast a sharp blue tone, best is to test your swatches with the lights in your home before you commit. The cardinal rule of painting is to test, test and lastly, test again. If you don’t test your paint sample, you’ll very likely wind up wasting an afternoon or weekend spent painting. Buy a sample pot of paint and test them near all the sources of light in a room. You can also do it on a piece of wood or drywall and hold them up to your flooring, your tile, and other permanent fixtures to see how they complement each other. The dining room is an integral part of a home. This is the place where family and friends gather together on special occasions to enjoy festive meals. For many families, this is the place whereby ties are fostered over a hearty meal and not to mention, where free flow of conversation takes place. It is therefore important, to ensure that your dining room is both stylish and comfortable. The design of the dining room set should represent your personal style. If your taste is modern, you can consider a glass top dining table with a chrome base and match it with chairs in leather or fabric. Alternatively, if you prefer traditional, wooden carved dining table with matching wooden or upholstered dining chairs may be an option. On the other hand, if your preference is transitional, then you could choose a linear style dining table and match them with linear-style upholstered chairs. Firstly, it is important to take note of the size of your dining room. You should always allocate space for traffic flow around the table so that people are able to move in and out comfortably. 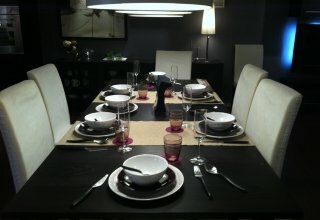 The size of the dining table should be able to accommodate your family members and friends. You may have always dreamed of a spacious oval table for your dining room but if you have a small square dining room, you may want to consider getting something that would not take up too much space. Choosing a round or square table will help optimize the space available. Oval or rectangular tables work better in long narrow rooms and they also leave more space for traffic flow on the sides.. It is always important to measure any chairs you buy with your table to ensure that you get sufficient lap and leg room. To avoid the hassle, best is to invest in a dining room chair and table set. That way, you can be fairly sure that the table and chairs coordinate perfectly. But it is still good to test out the dining table by sitting on the chair just to be sure.